As everyone knows, come this time of year Austin, TX is the Panel For Just About Anything Pop-Culturally-Imaginable Capital of the World. 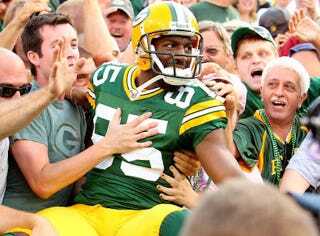 Green Bay Packers wide receiver Greg Jennings was present for one such panel—on fantasy sports. During the round table discussion, Jennings admitted that players are concerned about their fantasy stock perhaps more than we even thought. Jennings repeatedly cracked up with the audience and his fellow panelists - who included executives from ESPN, Bloomberg Sports and CBS - with his candor. At one point, he recounted playing a game against the Pittsburgh Steelers during a lull in his season and being screamed at by a fan for his low fantasy production. After scoring an 80-yard touchdown in the game, Jennings said, "I wanted to turn around and be like, Am I still sucking for you? I remember sitting there and, like, I wanted to say something to a fan but I can't let them know they got to me, because it's fantasy football. But it's probably the most serious game out there." Players have mixed feelings about fantasy, he said. Many like it for the way it extends their fan bases throughout the league. But fans' heightened enthusiasm has its downside. "It's a unique deal where we mean more to a fan than we ever have," he says. "I remember getting hurt and I'm leaving the stadium, and first thing a guys says to me is, ‘Jennings, should I drop you from fantasy?' And you sit back like, ugh, really?" That "ugh" feeling has been expressed before, but it's fun to see the other side, too. Professional athletes are able to succeed in part because they are very competitive, but who knew they were so competitive and cared so much about fantasy that they try not to show just how competitive they actually are? Now stop being such a nerd, Greg and enjoy all those panels. I've been to the city a couple times and there truly is no where else on earth with panels like Austin. One on every street corner, it seems.